I was recently contacted by The Parkside School in Norwich, Norfolk as they were interested in costings for a custom made 360 degree virtual reality tour. The Parkside School are a specialist communication and interaction school that supports the needs of individual pupils who often have sensory or learning disabilities. The school has a large catchment area beyond Norwich itself, and its gained a very good reputation but wanted to raise their profile amongst all the competition. 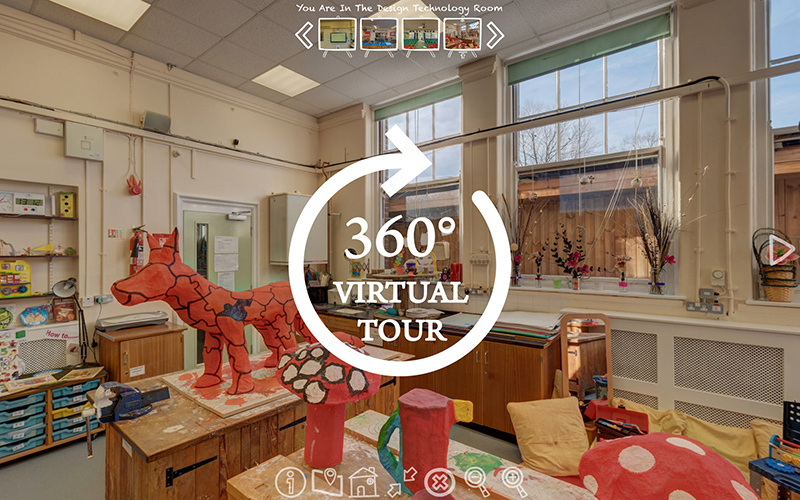 The Parkside School felt that a high quality virtual tour would also allow parents and children to view the school without needing to arrange a private visit. This way, it was possible to see what amenities the school had to offer and if necessary then make a proper visit before enrolment. As you can see, the tour itself has sixteen rooms and my web team and I designed a ‘fun’ interface with a school theme that would appeal to young children who’d be spending so much of their time there. I chose a school chalk blackboard graphic as the ‘intro splash screen’, small blackboards as thumbnail image cases and some sketchpad style standard vector graphic icons for the buttons. The tour also has ultra high 24k resolution (24,000 pixel x 12,000 pixel / 288 megapixel) which allows viewers to zoom in to close detail and really look around, along with a Google Map function to pinpoint the location in Norwich city. The tour also works with Google Cardboard and similar types of VR headsets when viewed on a mobile phone device. This is proving to be particularly popular with autistic pupils who want to experience the school atmosphere without an actual visit. The Parkside School, Norwich, Norfolk 360 degree virtual reality tour.